The décolletage should be explored when a discussion about toxin for the neck lines and bands is performed. The platysma muscle is the most important muscle that should be treated for the necklace lines, bands, and facial contour. To obtain the best outcomes, we need to understand the main features of the platysma’s anatomy and define if the muscle contraction is the main cause or if it has a coadjuvant role in the etiology of V-shaped lines on décolletage area. Nowadays, there are a plenty of techniques used to treat this region, before or after botulinum toxin injection, such as LASERs, IPL, collagen stimulation products or fillers, ultrasound equipment, and others. With the improvement of the aesthetic facial and neck treatments, patients started complaining of other aging signs on the body as the décolletage(Becker-Wegerich et al. 2002), arms, hands, belly button, thighs, and legs, as a natural evolution of the art of rejuvenation (Carruthers and Carruthers 2003). However, as for all new indications, it is necessary to understand the anatomy and to know the right techniques to obtain best results. In the beginning, we used to treat the neck separately from the chest/décolletage and did not realize that they contract as a unique structure. Patient asking for an exclusive décolletage (Spósito 2002) line treatment is rare. In most cases, they come to the office at their middle age with some signs of aging, such as poikiloderma, melanosis, keratosis, and elastosis. This clinical presentation needs a rejuvenation program, because BTXA injection performed isolated will probably give a very light improvement. Platysma is a muscle that covers partially the lower face, the neck, the chest, the pectoralis major, and the deltoid and overlaps the sternocleidomastoid, and its fibers cross the clavicle and proceed obliquely upward and medially along the side of the neck (Fig. 1a, b). The term platys is a Greek etymology of “wide” and originates at the subcutaneous layer and fascia covering the pectoralis major and the deltoid at the level of the first or second rib and inserts at the lower border of the mandible at the symphysis, the risorius, and the skin of the lower face, including the zygomaticus and the orbicularis oris area. 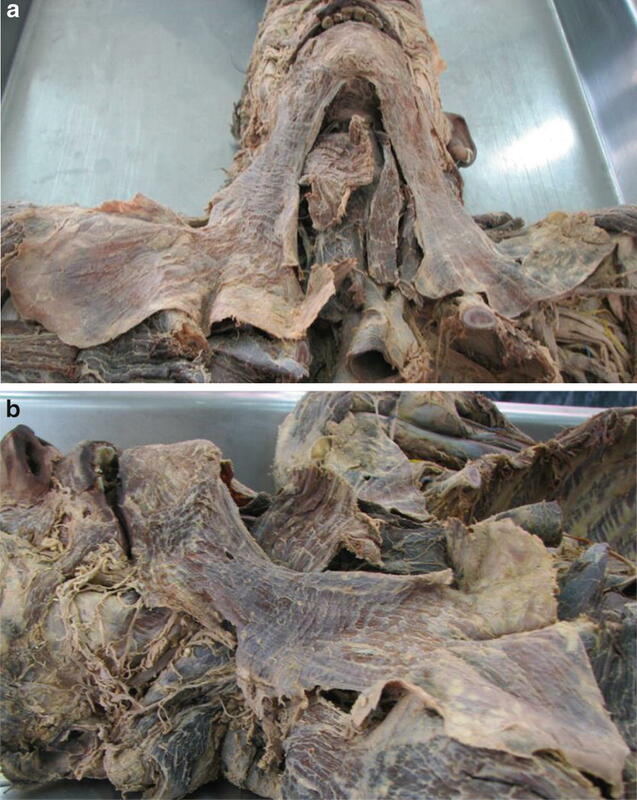 Platysma depresses the angle of the lower lip, forming lines at the neck skin and the upper chest when the jaws are “clenched,” and is innervated by the VII facial cervical branch (Tamura and Anatomia 2010a, b; Matarasso et al. 1999; Tamura 2012; Gray 2008). The fibers of each side of the platysma intermingle together below and behind the symphysis mentis (not a real symphysis), where they can be fused at an early period of life. It is not a true symphysis as there is no cartilage between the two sides of the mandible. Beneath the platysma, the external jugular vein descends from the angle of the mandible to the clavicle. Variations occur in the extension over the face and over the clavicle and shoulder; it may be absent or interdigitate with the muscle of the opposite side in front of the neck; attachment to clavicle, mastoid process, or occipital bone occurs. Neck bands become most noticeable with age, aggravated by weight lifting or facelift. The larynx and the muscles of deglutition are located deep to the platysma in the neck, but the platysma is very thin at the medial area; thus, we need to remember the main muscles at this area, the suprahyoid muscles, the digastric, the stylohyoid, the mylohyoid, and the sternocleidomastoid, and the infrahyoid muscles, the sternohyoid, thyrohyoid, and the omohyoid. The muscles from the jaw to the clavicle participate with the sternocleidomastoid and platysma for the movement of the neck, especially to move the head upward and downward but also to participate on the deglutition. Impairment of these muscles might lead to dysphagia, weakness of the neck for movements as pulling the head, and also respiratory complications (Tamura and Anatomia 2010a, b; Matarasso et al. 1999; Tamura 2012; Gray 2008). Besides the regional anatomy knowledge, it is crucial to diagnose correctly which patient has lines at the décolletage that can be improved with BTXA injections (Kane 1999; De Almeida et al. 2017; Labbé et al. 2017). There are at least three main clinical aspects: type I lines, which become visible or worsened with platysma contraction associated or not with moderate aging signs; type II skin lines, which become visible or worsened with platysma contraction with severe aging signs; and type III static lines without any movement on platysma contraction with mild, moderate, or severe aging process. The difficulty consists of diagnosing the types, extension, and strength of the platysma. BTXA will not improve static lines. Clenching the teeth firmly, forcing downward the angle of the mouth, and contracting the platysma at the facial contour, the neck, and the chest will give us a slight clue of its extension, its contraction, and its role as one of the causes of the décolletage lines. If the area of the wrinkles corresponds to the area of the platysma, we delineate the area and mark the injections points every 1.5–2 cm, injecting 1–2U/point. Depending on the muscle strength, the distance can be shorter. The injection should be in the deep dermis as suggested in Fig. 2. Figure 3 shows the platysma contraction along the neck and chest. Best results might be achieved when all the extent of the platysma is treated. When injecting BTXA at the décolletage, best results are achieved when the neck area is also relaxed. Type I: Lines that become visible or worsened with platysma contraction associated or not with moderate aging signs. 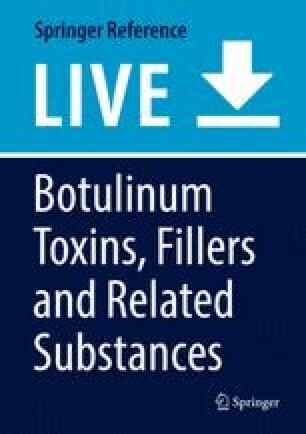 Botulinum toxin A is helpful with the right injection technique associated with other superficial aging skin treatments. Type II: Skin lines that become visible or worsened with platysma contraction with severe aging signs. First stage of treatment is to treat the skin. Options include topical creams, light-based devices, radiofrequency, peelings, collagen stimulators, fillers, and injectable hydration. If the lines are subtle, the treatment of the skin might improve, but if the lines are deep, due to the platysma muscle, BTXA might soften them. Type III: Static lines without any movement on platysma contraction with mild, moderate, or severe aging process. Options for skin treatment include light-based devices, radiofrequency, peelings, collagen stimulators, fillers, and injectable hydration. Additional topical creams can also be prescribed. BTXA might not be indicated. The most common undesirable side effect is ecchymosis that happens quite frequently. The muscles from the jaw to the clavicle participate with the sternocleidomastoid and platysma for the movement of the neck, especially to move the head upward and downward and to act as part of the deglutition. Impairment of these muscles might lead to dysphagia, weakness of the neck for movements as pulling the head, as well as respiratory complications (Tamura 2012; Klein 2003). These complications are mainly a consequence of the neck treatment, but not the chest treatment. To treat the décolletage, a rejuvenation program associating techniques is necessary, because BTXA performed isolated can promote a very light improvement. Variations occur in the extension over the face and over the clavicle and shoulder; it may be absent or interdigitate with the muscle of the opposite side in front of the neck; attachment to clavicle, mastoid process, or occipital bone occurs. Besides the regional anatomy knowledge, it is crucial to diagnose correctly which patient has lines at the décolletage that can be improved with BTXA injections. If the area of the wrinkles corresponds to the area of the platysma, we delineate the area and mark the injection points every 1.5–2cm to inject 1–2U/point, depending upon the muscle strength. Few points must be considered when analyzing the right indication and techniques to reach a successful result. It is very important to understand and to control patient’s expectations. Considering the different types of décolletage, we could predict the best treatment and the best result. Labbé D, Rocha CS, de Souza Rocha F. Cervico-Mental angle suspensory ligament: the keystone to understand the cervico-mental angle and the aging process of the neck. Aesthetic Plastic Surg. 2017; https://doi.org/10.1007/s0026-017-0861-8.